Meat cooking workshop at ESS 2015. We recommend keeping the following things in mind as you develop your ideas for your workshop. Make sure you have a clear set of objectives for what skill(s) you’ll teach. Can you answer the question: “After this workshop, my participants will have learned how to…”? Even if your workshop is informational, think about how you can design a skills-based learning outcome. What are your infrastructure needs? Some of our spaces are indoors. Some are outdoors (Wilmot has forest, field, and a lovely pond). Some have tables and chairs. Some have electricity. One has a small kitchen. Consider attendance numbers. Does your workshop need a minimum number of people to be successful? A maximum? How might you structure your workshop to accommodate different numbers of attendees? Workshops at Epic Skill Swap have had as few as two and as many as 20+ attendees! Is your skill accessible to people of all ages and abilities? If not, consider a.) being prepared to modify it if kids or folks with mobility issues want to participate, or b.) stating those limitations clearly in your workshop description. Your meditation workshop might not be appropriate for wiggly toddlers, and that’s OK. You might be able to teach your acro yoga workshop with poses that work for someone who uses crutches or a wheelchair, or you might choose several possible routes for your plant ID workshop based on the abilities of the people who show up. Consider the impact your workshop topic may have on people with different perspectives and backgrounds. Some topics may have the potential to be uncomfortable for some members of our community. We want all workshops to feel emotionally and physically safe for everyone. * How might you present your topic or provide context for the conversation in a way that promotes curiosity and learning? Unfamiliar with the term “cultural appropriation”? Read this article (warning: contains swear words). Already know about cultural appropriation and want to add some nuance to the conversation? Read this other article. One-on-one workshops require some additional considerations. Please see the Resources for One-on-One Workshop Leaders. *If a proposed workshop brings up questions of safety for anyone in the community, the organizing team has a process to facilitate a positive outcome. 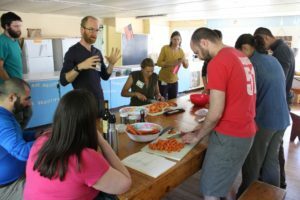 Our goal is for all workshops to run, supporting workshop leaders in bringing their skills and passions to Epic Skill Swap, while minimizing the potential for harmful conflict among participants. 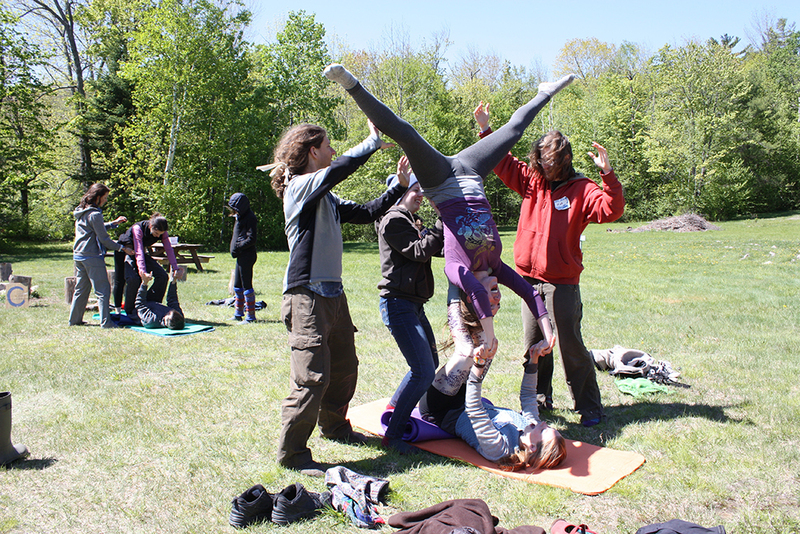 Partner acro yoga workshop at ESS 2015. There are no strict guidelines for workshop themes. Think in terms of what you know how to do or would like to know how to do. Here are just a few ideas to start you off: fixing something, building something, growing something, making something, or performing something! Past skill swaps have included everything from making herbal medicine to autobody repair to improv comedy to poetry writing to cutting hair to how to run for office. Check out the Past Swaps tab above with links to previous schedules. You don’t have to be an expert at something to lead a workshop. The best workshops are led by folks who are just plain excited about the skill they’re offering! If there’s something you know how to do that makes you happy, curious, satisfied, or fired up, and you know enough about it to pass on some skills, then you could absolutely lead a workshop on that topic. What if I can’t think of something to teach? First off, you do not have to teach a workshop in order to attend Skill Swap! Lots of people come to learn all the awesome stuff being offered. That said, consider asking some friends for input on things they’d like to learn from you. Sometimes we don’t see our own awesome skills right under our noses! How do I plan a workshop? We’ve got resources for that! First, consider the questions and tips above. We are also in the process of developing additional resources on workshop design (i.e. how to teach people a skill in an hour or two without a degree in instructional design): stay tuned for those coming in late spring. You are welcome to propose as many workshops as you want, but we generally limit each person to 1-2 workshops over the course of the weekend, to give everyone who wants to teach a chance to do so. We’ll let you know which of your proposals were the most popular based on the votes they received. If I didn’t submit a proposal, can I still participate in the voting process? Yes! You can help us a great deal with this process by voting on proposed workshops that would be of interest to you. This participatory process helps us develop a schedule tailored to meet your desires! I don’t want to teach a workshop. Can I still come? Yes! Yes yes yes yes yes!!! That said, we encourage you to consider teaching a workshop in the future. It’s an empowering experience in a supportive community that loves to teach and learn together.